End of an Era!! 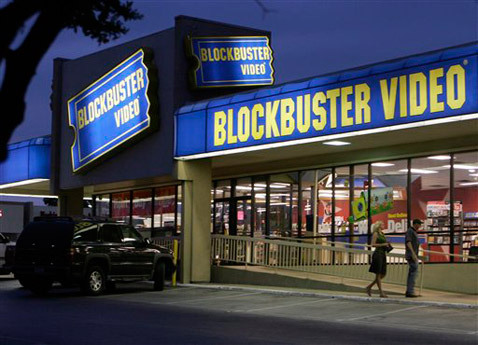 ‘Blockbuster’ Will Be Closing Their Remaining Stores This Year!! It truly is the end of an era. I remember growing up and always wanting to go to Blockbuster or Blockbuster Music to rent and or purchase movies, video games, and music. But over the past several years, Netflix, computers, Hulu, iTunes, and other streaming services have made it impossible for Blockbuster to profit. Hell, even Redbox has taken a lot of business away from the once media giant. But alas, Blockbuster is finally closing down its remaining 300 stores by January. We’ve seen this slow fall with Blockbuster for a few years now. To gain sales, they once tried to get rid of late fees. Remember that? It didn’t work. Then they tried their own version of Netflix, which also didn’t work, but is still trying to make a buck. And over the past couple of years, it’s quite difficult to find an actual brick and mortar Blockbuster store anywhere. They used to be on every corner. But now there are only 300 stores left and the Blockbuster by Mail service is also ending next month, along with the physical locations, according to the Chicago Tribune. Blockbuster is actually now owned by Dish Network and said it will focus the Blockbuster streaming and on-demand services to customers, which I bet within a year will go away too. Because I talk to a lot of people, and I haven’t yet met one person who uses Blockbuster for anything. Back in 2010, Blockbuster filed for bankruptcy and was $1.46 billion in debt. But it was purchases by Dish Network for a mere $320 million at an auction. It’s a dead format now, unfortunately. Well at least renting physical discs are. Since with Hulu and Netflix offering thousands of tv shows and movies for the price of one rental at Blockbuster. And that’s per month. So I say my farewell and goodbye to a lovely place where I used to frequent growing up. Take care Blockbuster. It was fun. Hulu Is Closer To Offering A Skinny Bundle For Cord-Cutters!!! Should The Pick and Pay Channel Option Replace Packages? This entry was posted on Wednesday, November 6th, 2013 at 1:54 pm	and is filed under Film, News. You can follow any responses to this entry through the RSS 2.0 feed. You can skip to the end and leave a response. Pinging is currently not allowed. « The History Channel Will Remake the ‘Roots’ Miniseries! !